You should make one and put it to good use! 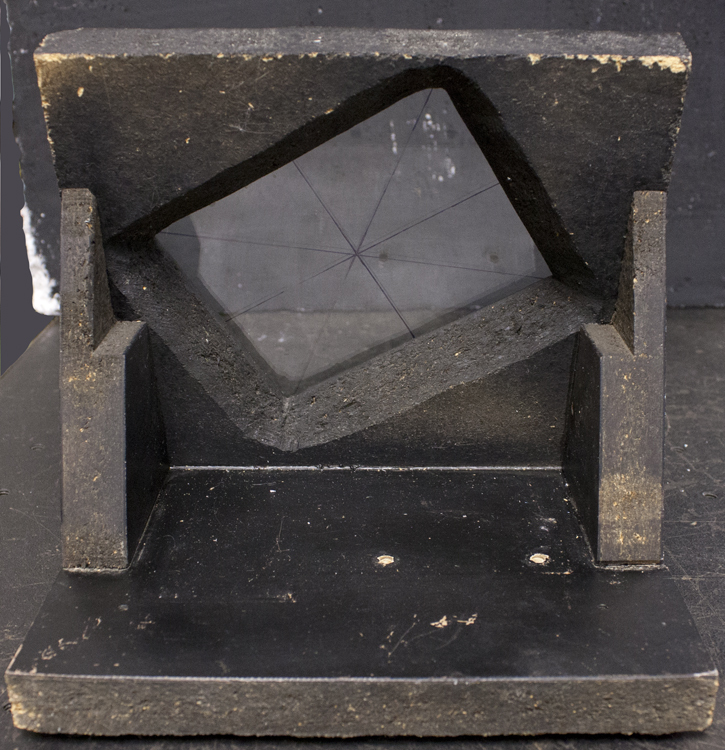 The Viking of Holography, Nils Abramson,is credited with the design of this device that is as dependable as gravity (to take a cue from the obsolete Kodak Carousel Slide Projectors) in its motion free plate holding capabilities. Three points determine a plane, and three screw heads on the frame determine the plane of the holographic plate or two plates, if one is pursuing the location of the zero order fringe through sandwich holography. Three pins locate the two bottom edges of the plate, and there are two lower edges as the plate is not held perfectly horizontally. 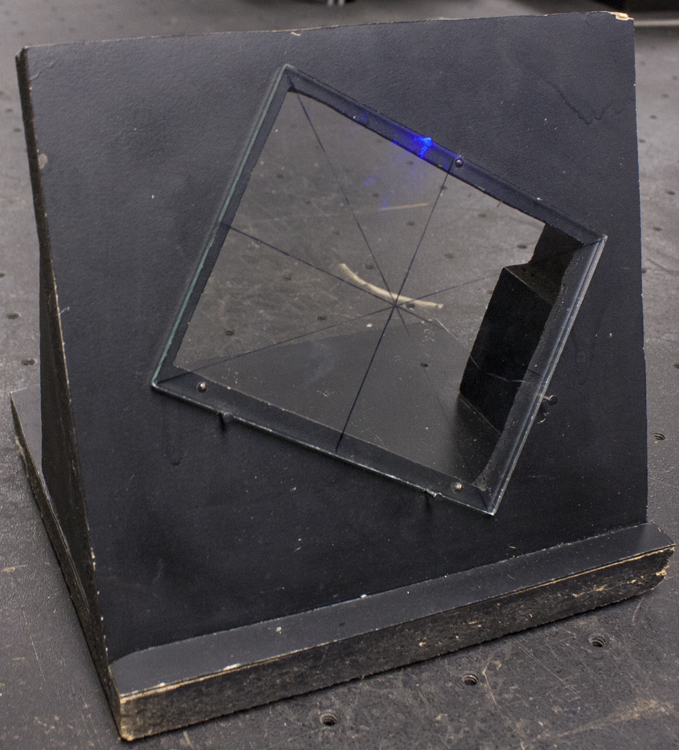 It’s a feature not a bug, as it can be difficult to find the proper rotational orientation of a processed plate when replacing it in the holder for real-time interferometry. The plate will slide down the “ramp” of the two pins on the long side of the plate and its motion arrested by the third one on the short edge, with the three screw heads determining the correct height in the other plane. This kinematic positioning method almost always guarantees live real-time fringe activity when replacing the plate! This one was made out of particle board at Lake Forest College. It works just fine, as long as the temperature and humidity stay stable! Long nails can cast shadows into the reference beam to establish orientation of the plate when re-plating. A trio of acorn nuts screwed on the underneath of the bottom plate maintain its stability on the table top like a tripod. The lip on the front allows the plateholder to be clamped to a screwtop table. Here it is in use with a B & W CCTV camera looking through the hologram. 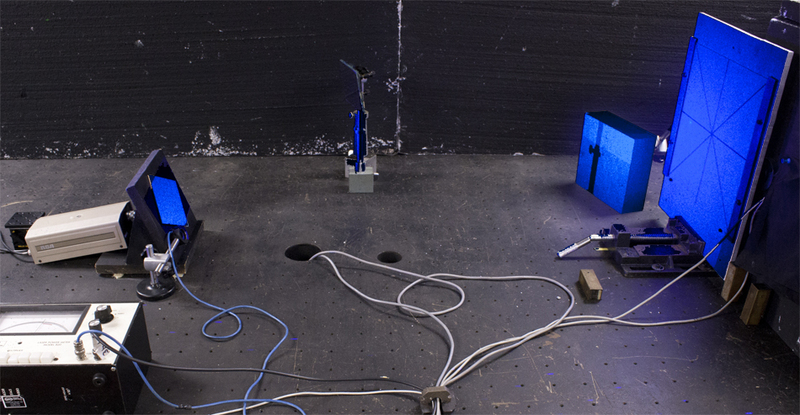 Although the orientation of the holographic plate is unconventional, this device ensures repeatable results and leaves one less piece of equipment to worry about when pursuing holographic interferometry. To see the rest of the story of this set up, click here.